Preventive psychiatry is one of the most ignored subdiscipline of psychiatry, which has got important role to play in the contemporary psychiatry. Mental disorders are very common with lifetime prevalence of about 25%, and tend to be chronic. Due to the stigma associated with mental disorders, lack of awareness, and also lack of adequate mental health resources, nearly 60%–80% of the persons suffering from mental disorders do not access mental health care services. Mental and substance use disorders have been identified as one of the major contributors to the disease-related burden and disability-adjusted life years. In this background, preventive psychiatry has an important role to play in public health sector. Since etiology of most of the mental disorders is not known, it is not possible to follow here the standard model of primary, secondary, and tertiary prevention of public health. A concept of universal, selective, and indicated prevention has been proposed in primary prevention. Preventive approaches in psychiatry focus on evidence-based risk and protective factors, promoting quality of life, reducing stressors, and improving resilience. Such interventions, when planned targeting at specific mental disorders, have a potential to prevent mental disorders. Thus, preventive psychiatry has a crucial role to play in mental health, considering the high prevalence of mental disorders, the associated disability and burden, and a great drain on human resources. Preventive psychiatry aims at the reduction of mental disorders and behavioural problems by identifying risk and protective factors and applying evidence-based interventions in the framework of primary, secondary and tertiary prevention. 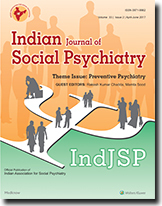 Preventive psychiatry located within a public mental health framework provides an opportunity to recognise important preventive elements in the existing psychiatric practice. Mental health professionals have several important roles to play in the prevention field. These include role of mental health advocates, technical advisers, program leaders, researchers and preventive care providers. In the last two and a half decades, there have been series of global burden of disease studies which have highlighted significant disability attributable to mental and behavioral disorders with a huge treatment gap. Integration of the preventive strategies in the clinical practice has the potential to reduce the disability due to mental illnesses. The patients come to the clinic with an intention to get treated and investigated for the symptoms they have. At this point, they may also be amenable to the advice related to prevention. Therefore, the clinical encounter can be seen as an opportunity to implement preventive strategies. 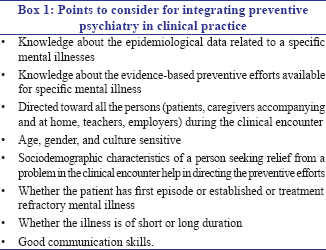 Preventive efforts in clinical practice must be guided by knowledge about the epidemiological data related to specific mental illnesses and about the evidence-based preventive strategies available for specific mental illnesses. These should be directed toward all those persons (patients, caregivers accompanying and at home, teachers, employers, etc.) who are present and also toward those who are not present during the clinical encounter and must be age, gender, and culture sensitive. Sociodemographic characteristics of a person seeking relief from a problem in the clinical encounter help in directing the preventive efforts. The preventive efforts are also driven by the fact that the patient has the first episode or established or treatment refractory mental illness and the short or long duration of illness. For prevention-minded clinical practice, it helps to have a template so that the assessments and interventions relevant for prevention can be carried out as per that scheme; it also helps in orienting the practicing mental health professionals. While making various assessments, making a list of the likely issues to be addressed by preventive efforts during clinical encounter ( first and subsequent) is also helpful. Common Mental Disoders (CMDs) include depressive and anxiety disorders; one in five individuals, worldwide, gets afflicted with CMDs over lifetime. A wide range of preventive strategies have shown promise when implemented across different stages of lifespan. There is a common thread of emerging preventive strategies for CMDs on the lines for those already established for non-communicable diseases. In India, although there is emerging research in this area, the much required prevention is still in its incipient stage. Some critical issues in planning research and implementing preventive strategies are also outlined to provide a more appropriate perspective. Only a limited research evidence is available from low- and middle-income countries for various preventive strategies for anxiety and mood disorders. In the context of these low-resource settings, the models of primary and secondary prevention have to be adapted to the available resources and sociocultural context. The thrust of preventive activities for common mental disorders, as per emerging evidence and expert consensus, may be placed on information and awareness campaigns, workplace prevention, task shifting to community health workers (CHWs), multi-sectoral collaborations with broad-based preventive approach, targeting multiple risk factors, identifying unique protective factors with cultural relevance, and use of modern technology and smart tools for cost-effective solutions with a wider reach. In the future research, the scalability aspects, cost-effectiveness evaluation, and methodological rigor as well as cultural acceptability should be important considerations. Since the 1990s, there has been a tremendous upsurge in research on early intervention in psychotic disorders. The neurodevelopmental hypothesis enabled the development of clinical staging models of schizophrenia, which in turn demonstrated that early intervention is possible before the onset of psychosis. Such intervention relied on early detection using prodromal vulnerability indicators and on targeted and stage-specific treatments. Initial efforts were focused on reducing the duration of untreated psychosis to improve outcome. As these efforts were not always successful, research moved on to the examination of prodromes and high-risk states. The “at-risk mental state” strategy based on principles of indicated prevention consisted of the “ultra-high risk” and the “basic symptoms” approaches. A large body of evidence indicated that about 30% of the patients who met criteria for either approach went on to develop full-blown psychosis in the next 2–3 years. Several early psychosis detection programs have been set up worldwide, and controlled trials have shown efficacy of early intervention in first-episode psychosis as well as prodromal or at-risk states. However, several issues regarding identifying and managing such patients still need to be sorted out before prevention of severe mental disorders becomes a reality. Research in the field of preventive psychiatry is consistently developing. Previous literature has provided information of transformational epidemiology of prodromal and early stages of psychosis into the full blown psychotic state. Recent studies have focused on delivering preventive interventions in such population cohorts and have reported mixed findings. Several evidence-based recommendations for early intervention have been mentioned, although more data are required to formulate a specific robust plan keeping in mind the potential role of treatment and age effects. This article mentions certain steps to cater for a preventive approach in psychiatry, particularly severe mental disorders. Drug use among adolescents is on the rise, posing a great challenge to the health-care providers. The above concerns have led to recent research initiatives aiming at the development of preventive interventions for adolescents. This review gives an overview of such initiatives which target at reducing modifiable risk factors and enhancing protective factors through family, school, and community prevention programs. Substance use continues to be a major public health problem for the low- and middle-income countries (LMICs) around the world. Prevention strategies, which are theoretically grounded, culturally sensitive, and cost effective, can help such resource-constrained nations mount effective control measures against drug use. Multisectorial involvement and multistakeholder participation can result in the development of sustainable prevention programs which earn long-term benefits for the nation. This narrative review looks into the various principles of primary prevention in drug use disorders and discusses the merits and effectiveness of varied intervention strategies used for universal, selective, or targeted prevention of drug use. Although evidence for effectiveness exists for various prevention programs in high-income countries (HICs), research from the developing world remains scarce. This paper focuses specifically on strategies which have found usefulness in other LMICs and interprets interventions from HICs in light of such findings. Policy-based programs, population interventions, community efforts, and treatment strategies are discussed to understand best pathways for prevention in various settings. Childhood and adolescence are periods of growth and development that are critical to the formation of adult personality and psychopathology. Moreover, childhood psychopathology may differ significantly in presentation and risk factors from those seen among adults and may require different preventive strategies. Service-related characteristics such as the shortage of trained child and adolescent mental health professionals also demand that the focus should shift from resource-intensive treatment interventions, toward preventive measures that can be delivered at lower cost in terms of workforce, money, and time; and can lead to improved outcomes for a wide variety of conditions. Preventive strategies that have been implemented in this population have mostly included both preventive measures (aiming at reducing the prevalence of risk factors) and promotive components (aimed at increasing resilience and positive mental health characteristics), usually in combination. Interventions have been shown to be most effective when they are targeted at underlying latent structures that predict risk; they are also more effective when delivered over a prolonged period. Interventions must also be formulated such that they are developmentally appropriate, and with clearly stated outcome parameters for evaluation. A few example interventions that have made use of these strategies are discussed in the course of this article. Preventive measures for mental health issues among children have received meager attention. Although the prevalence rates of mental disorders are significant, systematic focused efforts toward management specifically in this special population in low-resources settings have been markedly inconsequential. Certainly, unlike other medical conditions, policies, and services related to mental health of children and adolescent are not adequate and efficient to deal with the burden of mental disorders in children and adolescents. This article reviews the available resources and highlights the possible strengths that can be utilized in prevention strategies. In the last couple of decades, researchers have focused on finding strategies for the prevention of cognitive decline in the geriatric age group. Equivocal evidence is available from high-quality randomized controlled studies regarding causative role of modifiable midlife risk factors in cognitive decline and dementia. Among the cardiovascular risk factors, hypertension, hyperlipidemia, obesity, high saturated fat intake, and cigarette smoking have been found to be present in more than 50% of the cases of dementia and cognitive decline. Adopting healthy lifestyle changes with diet, regular moderate levels of physical activity, and abstinence from substance use have been found to have consistent evidence in the prevention of cognitive decline among other ambiguous findings across cultures. Studies assessing preventive and beneficial role of pharmacological treatment strategies such as preemptive use of disease modifying drugs, cerebroactive drugs, and nutritional supplements have been inconclusive. Psychological intervention strategies have shown some promising results. This review attempts to understand some of the perplexing issues in the prevention of cognitive decline in old age. Recently, the global population is aging as a result of demographic transition. The elderly are at a higher risk of developing mental illness. This could be due to many reasons including biological factors such as multiple physical illnesses and their treatments and psychosocial factors such as migration, social isolation, and changing family structure. At times, the psychiatric illnesses in the elderly present with atypical features and often go unnoticed. There is a huge treatment gap in addressing the mental health issues of older adults in low-resource countries like India. So far, the preventive aspects in psychiatry are less developed and the mental health care mainly focuses on sickness and treatment. As the number of trained mental health professionals and resources allocated to the field of mental health is meager in low-resource settings, prevention of psychiatric disorders in older adults seems to be a cost-effective option for these settings. In this article, various measures for prevention of psychiatric disorders in elderly low-resource settings have been discussed. Suicide is a major public health problem in India, probably even bigger than in the West. Suicidal behavior is the best conceptualized as a multifaceted complex problem involving social factors and mental illnesses. Broadly, there are two approaches to suicide prevention; population preventive strategies and high-risk preventive strategies. Population preventive strategies include reducing availability of means for suicide, education of primary care physicians, influencing media portrayal of suicidal behavior, education of the public, telephone helplines, and addressing economic issues associated with suicidal behavior. High-risk preventive strategy includes identifying individuals with high risk of committing suicide, intensively treating mental illness if present, and providing psychosocial support. Thus, prevention requires a multipronged effort with collaboration from various sectors including mental health professionals, social justice department, and macroeconomic policy makers. Mental and behavioral disorders are responsible for 7.4% of the total disease burden. Even with optimal care and service delivery, <30% of the burden of disease attributable to mental disorders can be averted, making a strong case for an increase in preventive efforts in psychiatry and mental health promotion. Clinicians can play an important role in implementation of preventive interventions. To carry out these important preventive skills, the training of the future physicians and psychiatrists should incorporate mental health prevention and promotion in the medical curriculum. Although preventive aspects of mental health have been included in the medical curriculum for undergraduates and postgraduates, most of the emphasis during training is on the curative aspects. In this article, various ways of enhancing mental health prevention and promotion component in the undergraduate and postgraduate medical curriculum have been discussed. The focus in public health has been shifted to noncommunicable diseases (NCD) in last decade. Mental health is gaining momentum as fifth NCD. The concept of prevention in psychiatry is new, but an interesting area from public health perspectives. The concepts of primary, secondary, and tertiary prevention relevant to psychiatry are discussed. Among primary prevention interventions, universal, selective, and indicated prevention strategies in psychiatry are discussed with examples from published literature. Challenges in preventive psychiatric practice on issue of payments, available standard of evidence, and best health-care professionals for its delivery are also discussed. There is a need to focus on preventive psychiatric interventions, especially in developing countries. Prevention of mental disorders offers opportunities for decreasing enormous health, economic, and social burden attributable to them. Substantial evidence exist showing effectiveness of prevention strategies in reducing risk factors, strengthening protective factors, and decreasing psychiatric symptoms and disability. The government and various stakeholders should work toward developing policies on national and regional levels for the prevention of mental disorders and integrate them with various public policies. Research should be focused on enhancing the evidence base for these interventions. It should also cover additional domains such as quantification of the burden of disease associated with particular risk factors, the interaction between lifestyle behaviors and mental health, and integrating mental health outcome measures in large community-based interventions for noncommunicable diseases. Special efforts should be made in devising alternative strategies to deliver these programs in low-resource settings. Integrating the research from the field of neurosciences with prevention strategies can augment the effort in this direction. One of the important challenges is to design programs that are either indigenously developed or culturally adapted. Mental health professionals have to play an important and multiple roles to make prevention of mental and behavioral disorders a reality. Introduction: HIV/AIDS is one of the most devastating illnesses that humanity has ever faced. Depression in HIV/AIDS patients is very common but the factors affecting it are not well studied. Therefore, the present study aims to assess the prevalence and the predictors of depression among people living with HIV/AIDS (PLHA). Methods: A cross-sectional study was conducted from November 2013 to March 2014 at antiretroviral therapy centers of two tertiary care hospitals in Lucknow and a total of 322 adult HIV patients on antiretroviral treatment for at least 6 months were interviewed with the help of a predesigned and pretested schedule. Systematic random sampling was used to recruit the patients. Becks depression inventory was used to measure depression. Results: About one-fifth (18.6%) of the patients were having depressive symptoms. Multivariate logistic regression analysis revealed that depression was significantly associated with female gender (odds ratio [OR]: 3.45; 95% confidence interval [95% CI]: 1.50–7.90; P = 0.00), counseling gap more than 3 months (OR: 2.06; 95% CI: 1.14–4.21; P = 0.04), nonadherence to treatment (OR: 2.66; 95% CI: 1.47–6.19; P = 0.02), and socioeconomic status upper lower and below (OR: 2.08; 95% CI: 1.12–4.21; P = 0.04). Conclusions: Low socioeconomic status, female gender, long counseling gaps more than 3 months, and nonadherence to treatment were found to be important predictors of depression. Therefore, there is a need of timely assessment of the PLHA for depression to ensure early detection and management to maintain optimal adherence to the treatment. Background: There is paucity of published data pertaining to consultation psychiatric services (CLP) in India. The data available reflect the under developed status of this subspecialty and need for strengthening the same. Research assessing the effectiveness of CLP services is the need of the hour. Objectives: Current study was taken up with the aim to study the pattern of psychiatric referrals in a teaching hospital, and to study the effect of intervention in CLP at the end of 4 weeks. Materials and Method: Sample was drawn from Indoor patients referred to department of psychiatry. Psychiatric diagnosis was made using International classification of diseases (CD-10 DCR). Clinical Global Impression severity (CGI-S) and Improvement (CGI-I) ware used to assess the effect of psychiatric intervention after 4 weeks. Results: about half of patients were referred from Internal Medicine, followed by Neurological sciences and surgical branches. About 30% of patients had no diagnosable psychiatric disorder. Common reasons for referral were evaluation of medical patient having co- morbid psychiatric symptoms, followed by assessment for intentional self-harm, past history of psychiatric illness, and substance use. There was a statistically significant reduction in the mean CGI-S scores after four weeks (t=16.356; p <0.001). Mean CGI-I score after 4 weeks was 1.89(±0.993). suggesting much improvement. Conclusion: Majority of patients are referred to Psychiatry from internal medicine and neurology. About one-third of the patient did not receive any Psychiatric diagnosis. Psychiatric intervention was found to be significantly beneficial. Background/Objectives: Knowledge about mental illness is essential for family members to provide effective care at home to the person with mental illness. Existing literature has shown that family members either have poor knowledge or aware about some facts but not adequate for effective patient management. Moreover, many of the time, attitude toward mental illness is seen to be negative. The present study aimed to assess the knowledge of family members of persons with mental illness about mental illness and to find the demographic associates. Subjects and Methods: A cross-sectional descriptive study was conducted at the outpatient department (OPD) of a Tertiary Care Mental Health Institute in North-East India. Total 111 family members of patients diagnosed as psychosis (F20-F39; as per the International Classification of Diseases-10 diagnostic criteria) attending OPD for follow-up were selected purposively for the study. Structured sociodemographic pro forma and the Knowledge of Mental illness Questionnaire were used to collect data about knowledge of mental illness among the family members. Results: Data were analyzed with descriptive statistics, Chi-square test, and Pearson's correlation by using SPSS version 16.0. Family members' knowledge about mental illness was found to be inadequate in some areas. Knowledge about mental illness was found significantly correlated with family members' age (r = 0.254, P = 0.007) and caregiving duration (P = 0.268, P = 0.004). Family members' gender and relationship with patients were found to be significantly associated with knowledge of mental illness. Conclusion: The present study finding suggests for the need of intervention to enhance knowledge of family members about mental illness for better patient management. Context: There is paucity of data on the comparison of psychological distress among chronic noncommunicable disease (NCD) and healthy subjects in developing countries such as India. Objective: To assess and compare psychological distress and its associated factors among chronic disease and healthy subjects. Materials and Methods: A cross-sectional study was conducted in a rural field practice area attached to a tertiary care medical institution in Puducherry, India. Data were collected from the chronic disease subjects which included those with diabetes and or hypertension registered in the rural health center. Healthy subjects residing nearest to the corresponding case from the respective village were taken as controls. Psychological distress was assessed by General Health Questionnaire 12 (GHQ 12). Results: There were 260 subjects with 130 in each group. Subjects with chronic disease had significantly higher proportion of psychological distress (50.8%) compared to healthy subjects (35.4%). The mean ± standard deviation GHQ 12 score of those with chronic disease is also significantly higher than that of healthy subjects (13.35 ± 4.89 vs. 11.15 ± 4.43, P< 0.001). Binary logistic regression analysis showed that subjects with diabetes and/or hypertension had higher psychological distress (adjusted odds ratio = 1.9, 95% confidence interval: 1.1–3.5) compared to healthy subjects. Conclusion: Subjects with diabetes and/or hypertension have higher proportion of psychological distress compared to healthy subjects. Screening subjects with chronic NCD for psychological distress may help to take appropriate measures. Background/Objectives: The significance of need assessment has been widely recognized for providing holistic and quality care for mentally ill patients all over the world. The current study is an attempt to assess the unmet needs of patients with schizophrenia as perceived by themselves and their family caregivers. Methodology: Unmet needs were assessed on a convenience sample of 100 patients with schizophrenia and their respective 100 family caregivers from a psychiatric outpatient department of tertiary care hospital by Camberwell Assessment of Needs questionnaire using descriptive, cross-sectional, and comparative research design. Results: The results showed that mean number of unmet needs rated by patients was 7.23 (SD = 3.22) and the caregivers was 3.45 (SD = 2.43). Most common areas of unmet needs identified by patients were welfare benefits (79%), company (72%), information on condition and treatment (71%), psychological distress (70%), psychotic symptoms (57%), and physical health (55%). Most common unmet needs reported by caregivers were welfare benefits (77%), psychotic symptoms (55%), money (31%), psychological distress (29%), and information on condition and treatment (25%). Agreement on unmet needs of patients between the patients and caregivers was poor to fair in most of the areas of needs. Conclusions: There was high discrepancies and poor agreement on unmet needs perceived by patients and their family caregivers. There is a need to develop effective strategies to appreciate all the unmet needs of the patients accurately so as to act accordingly.